As Veterans Day approaches and thoughts of sacrifice and selfless service come to mind the Muckleshoot Indian Tribe has bigger thoughts. 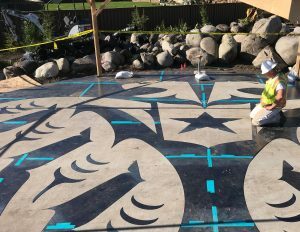 The tribe asked Long Painting Company to be a part of creating a spectacular memorial, to honor Veterans. The memorial is located at the MIT Veterans Memorial Plaza and Park. 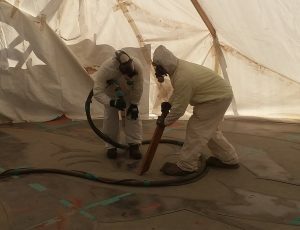 The project will entail sand blasting a beautiful design into concrete structures. 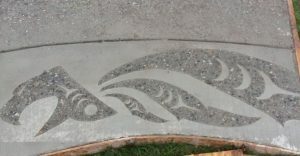 The design includes eagles, rivers, exposed river pebbles and various ancient Native American symbols. The design concept “The Long Way Home” represents the journey that veterans have taken, travelling from their native lands to faraway places to defend and protect the American people. This project is unique as it is utilizing our craft workers in the art of design. We started the project, which requires the use of large steel stencils, sand blasting equipment and creative thinking. Once the sand blasting is complete, the next step will be to stain the concrete to accentuate the look and feel of this very special memorial. Stay tuned to see photos of the finished memorial!